This op-ed originally appeared in The Charlotte Observer. Authors: Norman L. Christensen, Ph.D. & William H. Schlesinger, Ph.D.
Today we joined over 100 scientists to send a letter to Governor Roy Cooper, urging him to address the threats posed by the wood pellet industry and to protect North Carolina’s forests. These threats include emissions of greenhouse gasses and other pollutants and the degradation and loss of critical biodiversity. The world’s largest producer of wood pellets, Enviva, owns and operates three wood pellet facilities in North Carolina as well as a Virginia facility near our border. Meeting the production capacity of these four facilities requires logging, conservatively, nearly 50,000 acres of forest per year—often in ecologically important, native hardwood forests. The scale, location, and pace of such logging have very negative consequences for our environment, our climate, and our communities. Governor Cooper has pledged to uphold the goals of the Paris Climate Accord. Forest conservation and restoration are critical to meeting those goals. Forests are our most powerful tool to soak up carbon dioxide (CO2) from the atmosphere. Regrowth of forests in other areas removes about one-third of the CO2 emitted to the atmosphere by burning fossil fuels. But, when biomass from forests is burned for electricity, it immediately emits large amounts of CO2 to the atmosphere. The more biomass that is burned, the larger these emissions. Deforestation in tropical regions currently contributes about 10% to the rising concentrations of CO2 in the atmosphere. Burning trees for power emits more CO2 per unit of electricity than coal or gas plants. In addition, it releases harmful particulate matter and smog precursors. Yes, the regrowth of forests does recover this CO2, but very slowly. It takes many decades, sometimes more than a century, for forest land to recover the CO2 emitted from burning trees for energy, and successful regrowth is not guaranteed. As the just released National Climate Assessment indicates, we cannot defer action to reduce CO2 emissions to some future time. Biomass cannot be transported more than a short distance before the energy it contains is equivalent to the energy needed to haul it. 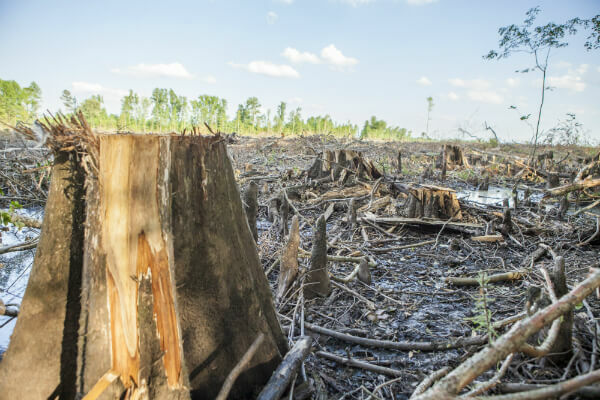 So, it doesn’t make sense that forests in North Carolina are being cut down, chopped into pellets, and shipped overseas to be burned in power stations in Europe—ironically, in the name of renewable energy. Healthy, native forest ecosystems are also vital for climate change adaptation and disaster readiness. Natural forests reduce the risk to low-lying and flood-prone areas, whereas forest degradation and clearcut logging increase flood risk and recovery costs. When the wood pellet industry drives the deforestation or degradation of coastal forests, we put coastal communities at greater risk for storms and flooding. As we pass the one year anniversary of Hurricane Matthew, and as recent hurricanes have brought tragedy and tremendous cost to the U.S. and its neighbors, it is more important than ever that we invest in keeping native forests standing. Enviva has proposed a fourth wood pellet facility in Richmond County, North Carolina, which is being challenged in the courts. Yet another wood pellet facility in North Carolina would add to existing assaults on our forests and climate. To stave off the worst effects of climate change, it is imperative that we reduce CO2 emissions—our forests are key to achieving that goal. Governor Cooper can lead the way in the charge to protect forests. Norman L. Christensen, Ph.D., is an emeritus professor of ecology and the founding dean of the Nicholas School of the Environment at Duke University. William H. Schlesinger, Ph.D., is a biogeochemist, a former dean of the Nicholas School of the Environment at Duke University, and President Emeritus of the Cary Institute of Ecosystem Studies.